6 Can statistics determine if Clemens used steroids? One more fagot of these adamantine bandages is the new science of Statistics. The following Forsooth is from the February 2008 issue of RSS NEWS. Twenty-six new cases of the inflammatory lung disease sarcoidosis [were seen amongst rescuers] in the first five years after 9/11. Five or fewer rescuers got sarcoidosis anually before 9/11. This Forsooth was suggested by Norton Starr. Strokes have tripled in recent years among middle-aged women in the U.S., an alarming trend doctors blame on the obesity epidemic. Nearly 2-percent of women ages 35 to 54 reported suffering a stroke in the most recent federal health survey, from 1999 to 2004. Only about half a percent did in the previous survey, from 1988 to 1994. The error resulted from the fact that the numbers were 0.6% and 1.8%. The reporters rounded down 0.6 to 0.5 and rounded up 1.8 to 2 but still said "tripled." In other words the, Associated Press feels that they must avoid such difficult numbers as .6 and 1.8. Much of the data on overweight people and obesity are limited, equivocal and compromised. The adverse effects of obesity on health are well established, serious, and causal. I didn't major in math, Huckabee said to the Conservative Political Action Conference meeting, according to the Associated Press. I majored in miracles, and I still believe in them. Conventional wisdom, indeed wisdom of any form, indicates that physical activity, a.k.a. regular exercise, is good for you. In particular, intuition would imply that the risk factors for age-related diseases such as diabetes, cancer, hypertension, obesity and osteoporosis would be reduced if people were engaged in physical activity. To make a direct connection between ageing and physical activity, consider a paper in the Archives of Internal Medicine (Vol.168, No. 2, January 28, 2008), “The Association Between Physical Activity in Leisure Time and Leukocyte Telomere Length” by Cherkas, et al. “Telomeres consist of tandemly repeated DNA sequences that play an important role in the structure and function of chromosomes.” Leukocyte telomere length (LTL) is a proxy variable for one’s biological age as opposed to one’s chronological age. That is, the longer one’s telomeres, the younger one actually is. Conversely, the shorter the telomeres, the more aged. 1. The article states, “The results of this study can be extrapolated to other white individuals (men and women) of North European origin.” Find a biologist or a helpful librarian to determine whether it is suspected that non-whites have different telomere lengths and/or have a different distribution. If so, what does this imply about telomere length and ageing? 2. There were about nine times as many women in the study as men. Why might this be a concern? 3. Something important is missing in Figure 1 and its absence serves to magnify the average difference. What is it? 4. The subjects in the study were twins and therefore, attracted extra lay media attention. Six of the ten authors are affiliated with Kings College, London. From the Kings College website, “Comparing the telomere lengths of twins who were raised together but take different amounts of exercise, reduces the effect of genetic and environmental variation and so provides a more powerful test of the hypothesis.” Obtain the article and reference #21 to determine why twins as subjects as opposed to non-twins are sort of beside the point. 5. There was a “discordant twin-pair analysis” performed “as a further confirmation of the larger analysis.” A paired 2-tailed t test for 67 twin pairs, separated by at least a two category difference is displayed in Figure 2. What defect does it share with Figure 1? Why is it even more misleading given that a paired t test is being done? 6. The article states, “A limitation of this type of study is that physical activity level was self-reported.” Why might this be a limitation? 7. Assume there is a positive association between LTL and physical activity. Give an alternative explanation to physical activity causing greater telomere length. Give another alternative explanation. Intuition can be deceiving. Obvious examples: the earth is flat and at the center of the solar system, Saddam must have had nuclear weapons, bootstrapping can't possibly be valid, earth, air, fire, water and that's it. An intuitive medical model of type 2 diabetes, according to an article by Rob Stein in the Washington Post of February 6, 2008, is "that the lower the blood sugar the better, and that lowering blood-sugar levels to normal saves lives." But, the results of the ACCORD (Action to Control Cardiovascular Risk in Diabetes) trial involving 10,251 randomly assigned patients turned out to "inject an element of uncertainty into what has been dogma." In the stronger words of Dr. Richard Grimm Jr. who helped design the study, "very surprising, shocking." Surprising and shocking because "257 patients receiving the intensive treatment [lowering the blood sugar level to that of a person who did not have diabetes] had died compared to 203 receiving the standard treatment [lowering the blood sugar level to that of the average person with diabetes]." This result "prompted federal health officials to abruptly stop one part of the trial so thousands of the type 2 diabetes patients in the study could be notified and switched to less risky treatment." Assume that approximately half of the 10,251 patients were in the intensive treatment group and half were in the standard treatment group. 1. Why would the researchers do a one-tail test rather than a two-tail test? Why is the P-Value so ridiculously high? Gavyn Davies does the maths, Gavyn Davies, The Guardian (UK), July 20 2006. This article relates how statisticians were called on to estimate the number of enemy tanks prior to the allied attack on the western front in 1944. The statisticians had one key piece of information, which was the serial numbers on a few captured tanks. Assuming that the tanks were logically numbered, in the order in which they were produced, was enough to enable the statisticians to make an estimate of the total number of tanks that had been produced up to any given moment, based on the highest serial number in the sample and the sample size. Suppose the tanks were numbered 1 to N, where N was the total number of tanks produced and that five tanks had been captured with serial numbers 20, 31, 43, 78 and 92, say. From a sample of S = 5 and a maximum serial number M = 92, it was deduced that a good estimator of the number of tanks would be (M-1)(S+1)/S. In the example given, this translates to (92-1)(5+1)/5, which equals 109.2. In reality, the estimated number was 245 per month and, after the war, it was confirmed that the actual number was 246, whereas intelligence estimates were incorrectly far higher. What assumptions are involved in the formula given in the article? How robust is the estimate? Should the serious consequence of the estimation (launching an invasion) have any influence on the way the estimation is performed? Can you think of any other information that might have helped to solve the problem? Can statistics determine if Clemens used steroids? The authors of this article are professors at the University of Pennsylvania’s Wharton School. Last week, Roger Clemens made the rounds on Capitol Hill to rebut charges by Brian McNamee, his former trainer, that he used steroids and human growth hormone late in his career. In addition, Clemens’ agents from Hendricks Sports Management have provided a report loaded with numbers — 45 pages, 18,000 words and 38 charts — to support his position. You can find the report here. 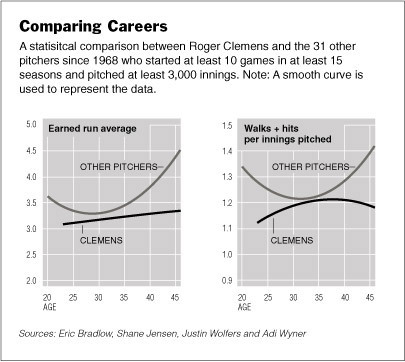 The report hinges on a critical question: Was Clemens’s late-career success highly unusual? If so, an unusual late-career improvement lends credence to the Mitchell report’s assertion that he used performance-enhancing drugs at various times from 1998 onward. The Clemens report tries to dispel this issue by comparing him with Nolan Ryan, who retired in 1993 at 46. In this comparison, Clemens does not look atypical — both enjoyed great success well into their 40s. Similar conclusions can be drawn when comparing Clemens with two contemporaries, Randy Johnson and Curt Schilling. A better approach to this problem involves comparing the career trajectories of all highly durable starting pitchers. We have analyzed the progress of Clemens as well as all 31 other pitchers since 1968 who started at least 10 games in at least 15 seasons, and pitched at least 3,000 innings. For two common pitching statistics, earned run average and walks-plus-hits per innings pitched, we fitted a smooth curve to all the data from these 31 pitchers and compared it with those for Clemens’s career. Our reading is that the available data on Clemens’ career strongly hint that some unusual factors may have been at play in producing his excellent late-career statistics. In any analysis of his career statistics, it is impossible to say whether this unusual factor was performance-enhancing drugs. The Clemens report argues that his longevity “was due to his ability to adjust his style of pitching as he got older, incorporating his very effective split-finger fastball to offset the decrease in the speed of his regular fastball caused by aging.” While this may be true, it is also just speculation: there is not a single number in the report quantifying the evolution of Clemens’s pitch selection. More details including more graphics for the Wharton study can be found in Wolfers' article "Analyzing Roger Clemens: A step-by-step guide" This article is followed by comments from 57 readers. Many of these want to see more details of this study. Justin Wolfer tells us that their article should be available in a few days and available from his website. Two interesting critiques of the Wharton study are given by Phil Birnbaum on his Sabermetric Research Blog. These are his February 10 posting: "Clemens Report" criticism misses the point and his Februry 11 posting: "The Wharton Clemens Report criticism -- Part 11"
Another article is "Roger Clemens, Barry Bonds, Performance-Enhancing Drugs, and Hypothesis Testing A Case Study in Baseball and Hypothesis Testing" by Phillip Mayfield. Mayfield explains what a test of hypothesis is, and how it is carried out, and illustrates this using two drugs controversies, one involving Roger Clemens and the other Barry Bonds. In the Clemens tests, there was not a significant increase in his pitching ability during a period that he was said to be using performance-enhancing drugs, but, in the Bonds study, there was a significant increases in his hitting ability over such a period. This would be an interesting article to discuss in an elementary statistics class. teammates by introducing them to steroids. It started with a horse called Isn't That Lucky and ended with one called A Dream Come True - a run of eight winners that turned a 50p stake into Britain's first million pound betting-shop pay-out. An unnamed small-time gambler, believed to be in his sixties, backed eight horses to win races in a multiple bet called an accumulator, at combined odds of nearly 2.8 million to one. If just one had lost, he would not have received a penny. David Hood, a spokesman for William Hill, said: "It is a staggering bet, and earns him a place in history as the world's first betting shop millionaire. Even a scriptwriter couldn't have dreamt this one up." His eight-horse accumulator, including three runners at Nad Al Sheba in Dubai, took him to the maximum betting-shop pay-out of £1m - but bookies Hills would have been within their rights to pay him only £100,000, their limit when selections in overseas horse-racing are included in a bet. They were happy to stump up £1m...possibly because of the timing of Freddie's flutter. It came bang in the middle of a court case in which a punter is taking Hills to court for allowing him to lose £2million when he'd allegedly asked to be banned. (1) How does this compare with winning the Powerball lottery jackpot? (2) How do you think the odds were determined for the horse race? Plus magazine opens a door to the world of maths, with all its beauty and applications, by providing articles from the top mathematicians and science writers on topics as diverse as art, medicine, cosmology and sport. You can read the latest Mathematical news on the site every week, subscribe to our fortnightly email newsletter, read our online magazine published four times a year, and browse our archive containing all past issues and news items. Issue 45 of Plus Magazine introduced a new column called "risk and uncertainty" written by David Spiegelhalter, Winton Professor for the Public Understanding of Risk at the University of Cambridge. Mike Pearson provides the animation for the first two columns. These 2 columns deal with what the British call League Tables but what we would call rankings. The first column appeared in Issue 45 and the second column second column in Issue 46. In the first column the authors provide an example of a League Table in which the outcomes should be pure chance but the results seem not to be consistent with pure chance. In the second column they discuss a League Table where the outcomes should depend on skill but chance also plays a role. For the first column the authors look at the results of the UK National Lottery from the time it started on the 19th of November 1994 to the 20th of October 2007. In this lottery six balls are randomly drawn from a set of 49 numbered balls. If you buy a ticket and correctly predict the six numbers, you get a share of the jackpot, which is usually a large amount of money. During the time considered, there were 1240 such draws of six numbers made by the lottery officials. An animation is provided that shows these winning six balls as they occurred. This results in the following histogram showing the number of times that each of the 49 numbers occurred in the draws. From this is appears that 38 was a lucky number and the authors ask if this could happen by chance. If the winning numbers were chosen at random, the number of times a number would be one of the winning numbers would have a Binomial distribution with mean np where n =1420 and p = 6/49 and variance = np(1-p). Thus, if the numbers are chosen randomly, the expected number of times a number occurs is 151.244, the variance is 133.244 and the standard deviation is 11.5432. From the histogram we see that the number 38 occurred 180 times which is about 2.5 standard deviations more than the expected number which is pretty unlikely if the numbers were chosen randomly. However, the authors provide more evidence that the numbers were chosen randomly with the following comparison between the observed distribution and the theoretical distribution. But the authors also look for the longest gap between times that a number is among the winning numbers. This was the gap of 72 draws, which occurred when number 17 appeared in draw 435 on the 23rd of February 2000, but did not appear again until draw 508 on the 4th of November 2000. The authors estimate that the probability that this would occur is about .000082 which again would suggest that the winning numbers were not chosen randomly. But what about that maximum gap of 72, which we worked out to be extremely unlikely? It turns out that we asked slightly the wrong question, namely: "The number 17 has just been drawn, what is the chance that it will not be drawn within the next 72 draws?" In reality, though, we are looking at the results of 1240 draws, rather than just 72, and we are not interested specifically in the number 17. What we should have asked is: "After 1240 draws, what is the chance that any of the gaps between two draws of the same number is greater than 72?". The authors carry out the calculations and find that the answer to this question is about 50% so here randomness wins. The authors go on to describe more sophisticated statistical methods for testing the hypothesis that the numbers were randomly chosen. The 1970 draft lottery for birthdates is reviewed as an example of a government effort at randomization whose inadequacy can be exhibited by a wide variety of statistical approaches. Several methods of analyzing these data -- which were of life-and-death importance to those concerned -- are given explicitly and numerous others are cited. In addition, the corresponding data for 1971 and for 1972 are included, as are the alphabetic lottery data, which were used to select draftees by the first letters of their names. Questions for class discussion are provided. The article ends with a survey of primary and secondary sources in print. We will discuss the second "Understanding Uncertainties" column in the next issue of chance news. (1) What is the probability that at least one number occurs 38 or more times? (2) How does one decide if a questions about the outcomes is a reasonable test for randomness? Understanding life — This category explores how stats and probability are used to understand all aspects of life, from death and disease to fraud. Lies, damn lies — This category focuses on those pitfalls and conundrums that sometimes contribute to our mistrust of stats. More Expensive Placebos Bring More Relief, Benedict Carey, The New York Times, March 5, 2008. The Nocebo Effect: Placebo's Evil Twin, Brian Reid, The Washington Post, April 30, 2002. This short article claims that a higher price can create the impression of higher value and that may explain the popularity of some high-cost drugs over cheaper alternatives. It’s all about expectations. When you’re expecting pain relief, you’re secreting your own opioids. And when you get it on discount, you doubt it, and your body doesn’t react as well. The article is based on a paper in The Journal of the American Medical Association in which 82 men and women rate the pain caused by electric shocks, before and after taking a pill. Half had read that the pill, described as a newly approved prescription pain reliever, cost $2.50 and half were told that it cose $0.10 but both were dummy pills. After correcting for each person's tolerance of pain, the pills had a strong placebo effect in both groups, but 85 percent of those using the expensive pills reported significant pain relief; compared with 61 percent on the cheaper pills. Other information like the country where the drugs were manufactured can also affect perceptions. How might you adjust an experiment to cater for such placebo related potential influences as the colour of the pill or where it is manufactured? Can you think of any other factors that might influence people's perceptions/expectations? How can you be sure that you have accounted for the major influences? Most people don't (and wouldn't) steal a pencil from a store but they do (or would) take a pencil from their workplace. So perhaps the issue is not about the number of pencils but rather the context where the pencil is to be had. How might a variable like 'context' (or emotions or or social norms) be incorporated into a statistical analysis? What criteria might be required before any of these factors could be incorporated into a statistical analysis, such as having objective, measurable and verifiable prior expectations? The opposite of placebo is nocebo (no-SEE-bo) - a substance producing harmful effects in someone because it is believed to be harmful, but which in reality is harmless i.e. presume the worst, health-wise, and that's just what they get. Do you expect there to be a nocebo effect in patients? Would it be measured in the same way as a placebo effect? Are the ethical considerations for nocebos different to those for placebos? If a nocebo effect is credible, what is the difference between it and voodoo, where a curse is placed on a person? Previous marketing studies have shown that it is possible to change people's reports of how good an experience is by changing their beliefs about the experience. For example, moviegoers will report liking a movie more when they hear beforehand how good it is. What are the effects of expectation, if any, on medical research not involving human subjects? If mice are given a placebo by lab technicians who believe they’re giving a drug, do the mice respond as if given the drug? Conversly, if the mice show no improvement with a placebo, might the lab technicians, thinking they’d administered a real drug, perceive improvement? Predictably Irrational: The Hidden Forces That Shape Our Decisions, a book by Dan Ariely, one of the paper's authors. The books claims that irrational behavior is a part of human nature, but irrational people tend to behave irrationally in a predictable fashion. There is a similar study about the perception of wine quality, based on price, Wine Study Shows Price Influences Perception. Changes in the stated price of a sampled wine influenced not only how good volunteers thought it tasted, but the activity of a brain region that is involved in our experience of pleasure. Is there an ethical way to fine-tune the placebo effect? Clive Cookson, March 1 2008. How the placebo effect helps cure my ailments, Jeffrey Frankel, March 8 2008. Doctors, drugs and alternative therapies, Michael Skapinker, March 11 2008. This page was last edited on 25 March 2008, at 16:44.